Apple has managed a marketing masterstroke with the iPhone XR: not only has it delayed the launch of the third of its trio of 2018 iPhones, thus creating some mystery around it, it’s also managed to make this seem like 2018's ‘cheap’ iPhone. Yes, it’s cheaper compared to the recently-launched iPhone XS and iPhone XS Max, but we’re talking $749 (£749 / AU$1229) compared with $999 (£999 / AU$1,629), which is hardly budget. To the average price-conscious, brand-neutral buyer this is a long way from a ‘cheap iPhone’. To the Apple fan who wants to stick with the brand though, the iPhone XR offers a much cheaper way to get a 2018 model without having to pay the sky-high prices of the XS duo, without sacrificing too much in terms of features – and with a cheeky amount more performance than one might expect. iPhone XR colors - which is right for you? 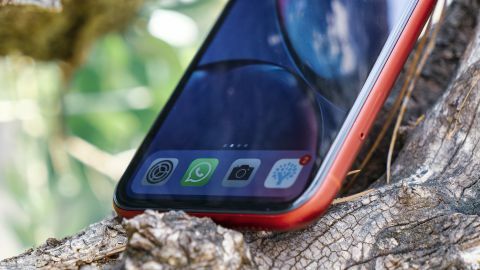 While it’s impossible to know for certain what Apple is aiming to achieve with the later launch of the iPhone XR, the fact remains that it’s already enjoyed the buzz of the new iPhone XS launch, and now has a second bite of the, er, apple in terms of generating hyper around this ‘mystery’ phone. Well, Apple has either pulled a marketing masterstroke or screwed itself by missing sales from launching late – as the XR is one of the best iPhones we’ve ever tested. The price of the iPhone XR is something that’s going to attract buyers: at $749 / £749 / AU$1229 for the 64GB model ($799 / £799 / AU$1299 for 128GB and $899 / £899 / AU$1479 for the 256GB) it’s far more affordable than the iPhone XS. You can now buy the phone around the world as it was released on October 26 2018, and it's on sale in Apple Stores and at your local phone emporium, with few concerns about stock levels. The price has yet to change much, even though the iPhone XR is now around half a year old. Some contracts are cheaper than others, and the cheapest prices can be found on our best iPhone XR deals guide and our guide to the best US iPhone XR deals too. Compared to the iPhone XS, the iPhone XR is downgraded in a number of ways to hit that lower price point. That said, there are a number of key features that are the same: iOS 12 is the operating system that runs things, and it’s backed up by the wildly-powerful A12 Bionic chipset inside. The notch contains all the same front-facing cameras and sensors as the iPhone XS, and the dual speakers still face the same way when pumping out sound. To the untrained eye, or someone not holding the iPhone XR and XS side by side, it might even be hard to instantly tell the two apart – but there are a number of key differences that we need to dig into. Arguably the most impressive thing about the iPhone XS is the camera, as it’s the only thing that feels significantly upgraded over the iPhone X. While the iPhone XR offers the same ‘standard’ lens as the XS, it lacks the telephoto second sensor, so has to do some fancy tricks with software to compensate. This means you won’t be able to zoom in as far with the XR, as the telephoto lens offers (relatively) lossless photography at two times zoom, while portrait mode, where the background is blurred out, isn’t as effective. You can still take a portrait shot and have the background attractively blurred to keep the focus on the subject, but unlike with the iPhone XS, you can’t take pictures of objects and animals in the same way. This is due to the fact the software can’t identify those subjects as easily from the single sensor, where the additional hardware on the more expensive XS is able to draw on more info. Apple is never one to shy away from some marketing hyperbole, and the iPhone XR comes with a ‘new’ type of LCD, a screen that’s been designed to allow it to make this curved, ‘all-screen’ display. The effect is much like the LCD screens Apple has made before, to be honest, as they’ve always been colorful and sharp, but with the new ‘Liquid Retina’ display things are supposed to closer to the high-end OLED screen. We’ll delve more into the quality of the screen later in this review, but it’s one of the key differences you’ll want to consider if you’re thinking about going for the less-costly iPhone. There’s one way to know if you use a feature on an iPhone, and that’s to take it away, and see if you miss it. Anyone coming from a later-series Apple handset will have had access to 3D Touch, where pressing the screen harder opens menus or activates different features in apps. This feature has been removed for the iPhone XR, presumably to save money – instead you have to do a ‘long press’ to do the same thing. So if you ever accessed shortcuts by pushing harder on an app, or opened the torch with a harder prod on the lock screen… well, that’s gone. We didn’t realise how much we used that feature before – and it’s irritating to not have something that feels like a real button to open the camera – but it doesn’t take long to get used to the alternative… it just feels a bit less premium. The iPhone XR is also a thicker design, with chunkier bezels around the side of the phone – hold it side by side with an iPhone XS and you’ll feel it’s clearly the cheaper model, with a thicker feel in the hand. However, looking at it and handling it in isolation you’ll just feel that it’s a smooth, rounded design that apes the popular form of the iPhone 7 or iPhone 8 – basically, the iPhone XR is the all-screen version of those handsets, bringing a screen the size of those on the iPhone 7 Plus or 8 Plus in a form factor that’s more akin to the smaller models. The notion that this is the new iPhone 5C is one that could be easily argued, as this is the first iPhone in a long time to come in so many colors: (product) RED, which is the sample we have, blue, white, yellow, coral and black. It's a nice look, although it would be nice to have some more flashes of color on the front of the phone too. If you're thinking of buying an iPhone from a fashion point of view, this could well be the way to do it, with the colors chosen impressing when we checked them all out at the launch event. Apple believes you’ll be able to get 90 minutes more battery life out of the iPhone XR than the 8 Plus, which is a big jump in real terms. Well – and we don’t want to spoil the surprise a little later – we’d say it’s even better: the iPhone XR finally achieves the holy grail of all-day battery life in an iPhone. Perhaps that’s giving Apple a little too much credit – after all, there are plenty of Android phones out there that can utterly smoke the iPhone range for power longevity, giving you far longer between charges. Apple has offered terrible battery life for years, incrementally improving it to be ‘just good enough’, and the iPhone XR is the first iPhone we haven’t had a real worry about day to day – and that alone could elevate it to the heights of being the greatest iPhone ever created.